Director – Giorgio Serafini, Screenplay – Garry Charles, Producers – Eric Balfour, Scott Dolezal & Robert Willems, Photography – Erik S. Curtis, Music – Edward Motter-Vlahakos, Visual Effects – Hip Films, Makeup Effects – Kristi Boul, Art Direction – Larry Wade Carrell. Production Company – Level 33 Entertainment/Blue Fox Entertainment/Smokehammer Media/West Arts/Champion Entertainment. 200 Degrees was the twelfth film from Giorgio Serafini, a director of Italian parents who was raised in Belgium. Serafini has made various films in the thriller and drama fields, although his only previous genre entry was the horror film Don’t Let Me Go (2013). He is a prolific director, having released eight films between 2011-5. As one watches 200 Degrees, he has another seven films either in production or completed and awaiting release. These include the very similarly premised Flashburn (2017), an SF film in which Sean Patrck Flanery plays an amnesiac virologist imprisoned in a warehouse and other genre entries such as The Executioners (2018) and Unhinged (2018) and the children’s film Pegasus: Pony with a Broken Wing (2019). Ever since the success of Phone Booth (2002), we have seen a spate of what I have termed ‘conceptual economy thrillers’, which attempt to set their dramas in the smallest space possible. Phone Booth was designed around the novelty of containing its protagonist inside the title cubicle for the duration of the film. There have been a number of other films that have built out on this idea with the likes of Black Water (2007), which took place in a tree as the cast were being menaced by a crocodile in the water below; Wind Chill (2007), a ghost story set inside a car; Shuttle (2008) with its protagonists held hostage in an airport shuttle; Buried (2010), which was set entirely around Ryan Reynolds trapped inside a coffin; Frozen (2010) with three characters trapped in mid-air on a ski chairlift; The Night Chronicles 1: Devil (2010) about five people trapped in an elevator with The Devil; ATM (2012) with three people trapped in an ATM booth by a killer; Detour (2013) and Curve (2015) with characters trapped in crashed SUVs; Landmine Goes Click (2015) with a character trapped standing on a landmine; The Shallows (2016) in which Blake Lively is stranded on a rock by the tide and menaced by a lurking shark; and Serpent (2017) with a couple trapped in a tent with a deadly snake. The premise for 200 Degrees has been fairly much stolen from Buried. Buried had Ryan Reynolds trapped in a coffin; by contrast, this has Eric Balfour locked inside a room in a warehouse with heat lamps that are gradually raising the temperature to the titular 200 degree. (The influence of Buried seems to be made overt in the naming of Eric Balfour’s character Ryan). Buried remained inside the coffin for the duration of the show and had Reynolds only reacting to other people via his cellphone; this similarly stays inside a locked room, although does break the containment in the concluding scenes that have Balfour exiting and interacting with other people. 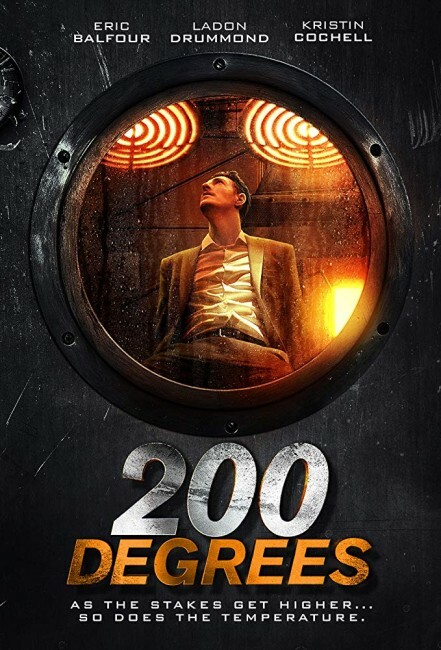 200 Degrees has also borrowed some of its premise from Phone Booth in the idea of the situation being orchestrated by a mystery figure who is determined to peel apart and expose the lies and hypocrisies of its self-centred protagonist’s life. The film starts in well, despite the obvious influence of Buried. There are minor credibility issues – if the room were getting so hot, why does Eric Balfour remain wearing a shirt, suit pants and shoes and socks for the entire show? At most, all he does is strip off his suit coat. Nevertheless, once the film starts to twist the screws on Balfour, it becomes rather gripping. Ever since I first saw Eric Balfour in tv’s Six Feet Under (2001-5), he struck me as an actor capable of going places, although since then his career has remained struck in the supporting category – unless you want to count the lead in the likes of Dinoshark (2010) and Little Dead Rotting Hood (2016). The scene where we see him on the phone pleading with investors, trying to sell them the most amazing bargains, all the while trying not to allow the panic in his voice to show, contains some great acting. Unfortunately, for me, the entire film started to fall down when it came to its end revelation. [PLOT SPOILERS]. I had no problems with the revelation of the agency behind everything. However, what then killed the show was the revelation that Eric Balfour had twigged to what was going on while in the kiln and had been playing a double game. I’m sorry but when an unknown crazy has you in a death trap and your life is ticking away, you are not going to have the foresight to conduct a double game and start twisting everything back on them. Moreover, this is something that requires the deductive certainty of a Sherlock Holmes to know that one is absolutely right based on some exceedingly slender hunches and clues.